The underlying purpose of Microsoft PowerApps is to allow any employee in an organisation to build basic mobile and web-based business applications; even if they do not have previous experience with software development and coding. Microsoft believe that this app-building democratisation is becoming more important, given all the data that organisations now accumulate on a day-to-day basis. By making it easier for more people to tap into this data, apps can be developed on a faster scale; as opposed to the process being exclusively accessible for an organisation’s IT department. One of the great features about PowerApps is that it can seamlessly integrate with other business services we use on a day-to-day basis. 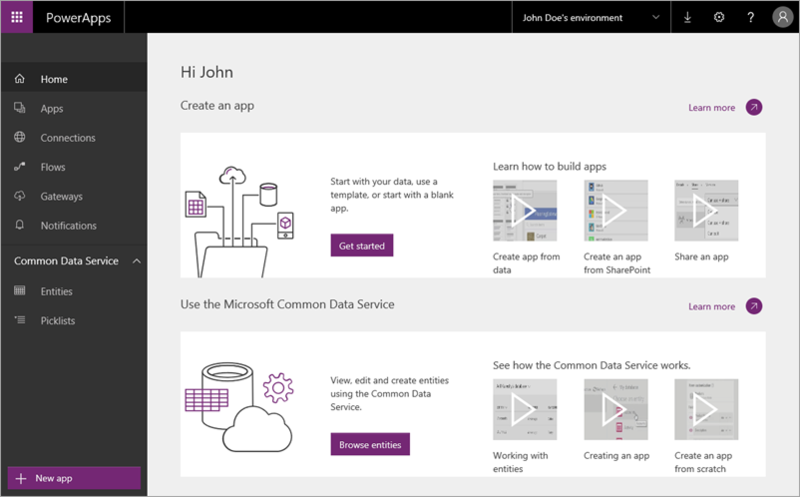 For example, you can connect the PowerApps platform to Office 365, Dynamics CRM and Salesforce; allowing you to build applications that draw data from these sources. Furthermore, if your organisation is already using database systems such as SharePoint, SQL Server or Oracle, you will find that PowerApps also offers seamless integration. By connecting to this existing infrastructure, getting started with PowerApps becomes quite straightforward. To make the adoption of PowerApps even easier, Microsoft includes a template functionality within the program. Once you have connected PowerApps to a particular data source, the software can analyse the format of the data and determine the best template for creating your app. For example, if you want to create an app based on financial data, PowerApps has an in-built Budget Tracker template which may suit your requirements. For companies in the real estate/construction industry, the Site Inspector template can also be used to create a workable app around the data you collect during routine assessments. Rest assured, PowerApps has been designed so that an organisation’s more-experienced IT department can still maintain control over how the platform is used by employees. For example, PowerApps contains in-built data security and privacy controls, ensuring that data access can be managed in line with corporate policies. On the flipside, an organisation’s IT team can also leverage the platform to distribute and enhance the apps that employees use. For example, PowerApps can integrate with Microsoft’s Azure App Service, allowing IT teams to deploy web and mobile apps across an organisation’s employee base faster than before. Furthermore, PowerApps allows an IT department to create additional data connections and application programming interfaces (APIs) that connect with pre-existing business systems in an organisation. In summary, PowerApps is a fantastic example about how technology is becoming more accessible to more people. By releasing a platform where people can create applications with greater ease, Microsoft is allowing organisations to spread the opportunity for innovation across their entire company. PowerApps is certainly a platform to watch. If you would like more information about this software and its potential, please do not hesitate to contact Comunet today.